apple coffee cake. When I went to the refrigerator to get the apples, to my surprise they had disappeared. I knew that I had not used them for anything and looked a second and even a third time, but no apples. At this point I thought that someone had to have eaten them and I had to scramble to find a plan B. It turns out that Mike had moved the apples to the pantry when we were getting ready to celebrate our daughter’s birthday. He was afraid that we would run out of room in the refrigerator and wanting to make more room and had moved them. The funny thing is that I am sure that I had noticed them in the pantry, but had it in my head that they were still where I had put them. But plan B really wasn’t all that bad; in fact it turned out quite well. 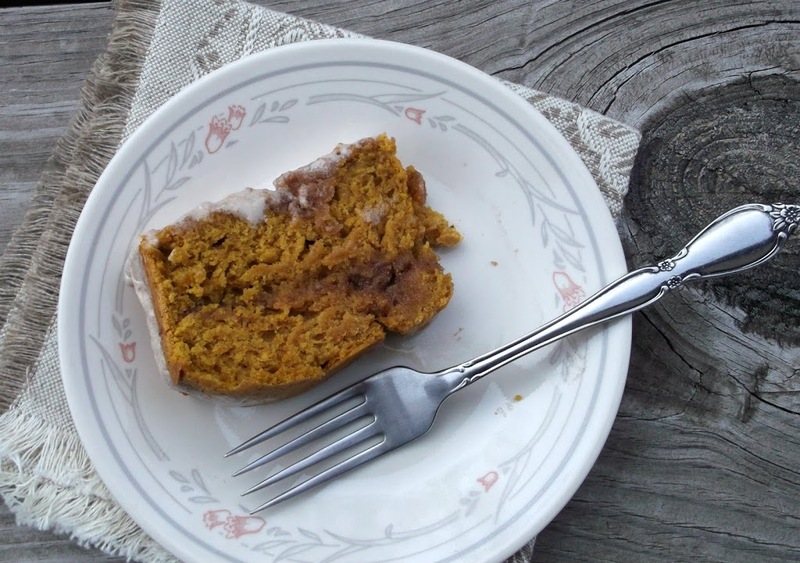 I had several cans of pumpkin in the pantry (now wouldn’t you have thought I would have noticed the apples when I got the pumpkin, they were sitting in plain sight) and decided on a pumpkin coffeecake. To be honest I have never thought of making a coffeecake with pumpkin before, so it may have been a blessing in disguise that I did not find the apples. The pumpkin is a nice dense coffeecake, not the light fluffy coffeecake that I normally have made. The streusel adds flavor with additional cinnamon and some brown sugar. To top it off the glaze completes this coffeecake. 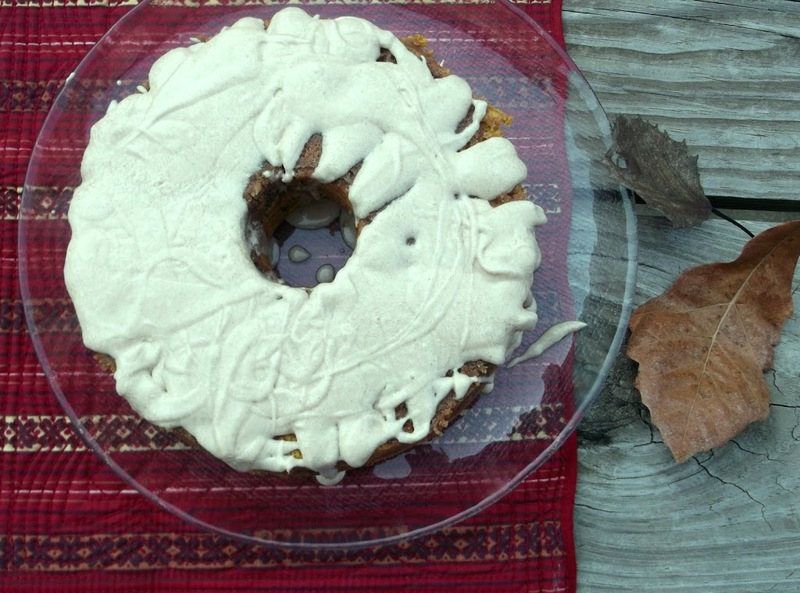 Pumpkin says fall to me and this coffeecake says delicious for breakfast or anytime of the day. In a large mixing bowl, beat the butter and sugar on medium speed until well blended. Add the pumpkin and eggs and mix thoroughly. In a medium bowl, combine the flour, baking powder, spices, and salt. Add the flour mixture to the pumpkin mixture, and mix on medium speed until combined. Set aside. Using the same medium mixed bow, make the streusel topping. Mix ingredients together with a wooden spoon until well combined. Spread half of the streusel in the bottom of a lightly greased tube pan or bundt pan (if using a tube pan wrap the bottom of pan with aluminum foil to prevent leakage). Pour half the batter over streusel, then the rest of the streusel, and then the remaining batter. Bake for 50 to 55 minutes or until a toothpick comes out clean. Cool on a wire rack for about 15 minutes. Slide a knife around the pan so the cake doesn’t stick when removing it. If using a tube pan you will have to run a knife around the tube and at the bottom of the pan. Invert the cake onto a serving plate. Cool completely before adding the brown butter glaze. Melt butter in bowl and add the remaining ingredients, beat until smooth. Drizzle glaze over the cake, letting the glaze run down the sides of the coffeecake. What a yummy way to start the day!!! Love all the dripping glaze…and I can never resist a cake with streusel 🙂 Hope you had a fantastic Thanksgiving! Love the flavors in this! I’m a big fan of pumpkin, and can never get enough. Other than pumpkin pie, we really haven’t baked much with it this season – this looks like a perfect recipe to try! Thanks so much. Sometimes things in plain sight are impossible to see. 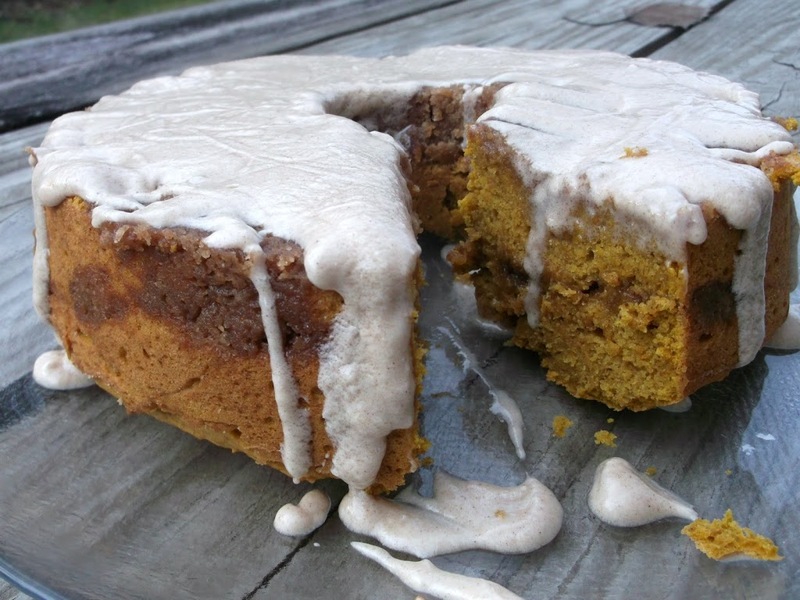 Your end result of the pumpkin coffeecake sounds terrific. Oh I feel like baking allready – the cake looks so yummy and soft, love the icing!